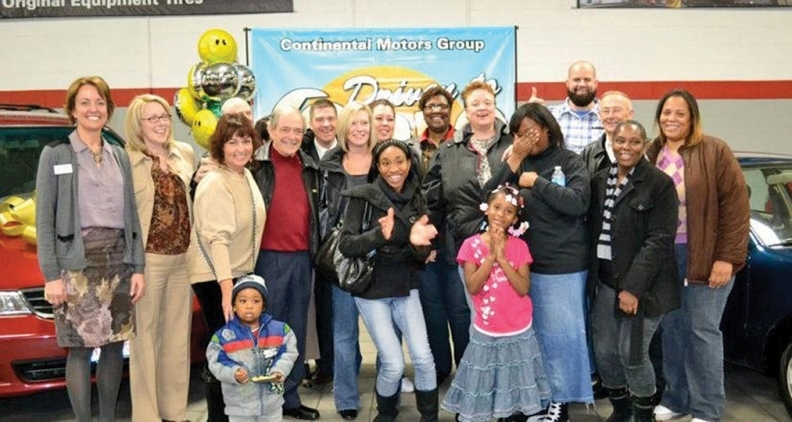 Under the Driven to Care program, each Continental Motors Group dealership donates one used vehicle a year to an individual or a family in need. Shown are recipients of vehicles along with dealership representatives. * Cool perk: The dealership uses a recognition tool called a "Kb Moment." "Kb" stands for Kundenbegeisterung, which means creating fans of the brand. When associates go above and beyond to surprise and delight a customer or help a co-worker, they can receive a "Kb Moment" card. The cards are worth $5 and can be redeemed for American Express gift cards in $25 increments. The cards are also used for drawings for prizes during all-dealership luncheons and the year-end party. * Weinberger on showing employees that they are valued: "On a daily basis, I forward an email of all positive online reviews to the associates responsible for the great experience with a note from me thanking them for the outstanding effort. Each month, our internal newsletter recognizes the top performances and achievements in the dealership during the prior month and highlights the positive online review comments from that month. The newsletter is also a place where associates can submit news, including updates on the accomplishments of family members. Each quarter, I host a catered luncheon to discuss our progress toward meeting objectives and also highlight the outstanding performances and deeds of our staff." * Weinberger on a change in response to staff requests: "The area in front of our dealership is congested with vehicle traffic, particularly during peak commuting hours. This makes it difficult and time-consuming for our technicians to perform quality checks on service vehicles. The techs came up with the idea of opening a rear entrance that connects with an adjacent strip mall that would allow easier and faster access to the main road. The general manager contacted the strip mall owner and negotiated permission to make a curb cut and open a pathway out the back of our lot onto the mall lot."